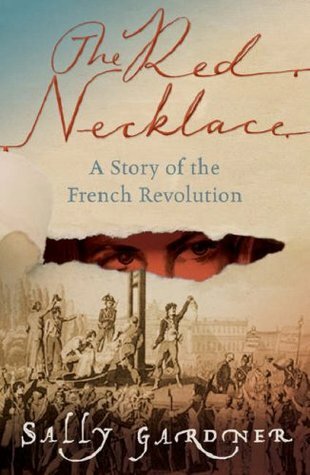 Set during the tumultuous times of the French Revolution in the 18th century, this novel tells the tale of two unlikely teens caught up in the whirlwind of confusion, and tensions between the aristocrats and the peasants in the streets. The story of a remarkable boy called Yann Margoza; Tetu the dwarf, his friend and mentor; Sido, unloved daughter of a foolish Marquis; and Count Kalliovski, Grand Master of a secret society, who has half the aristocracy in thrall to him, and wants Yann dead. Yann is spirited away to London but three years later, when Paris is gripped by the bloody horrors of the Revolution, he returns, charged with two missions: to find out Kalliovski’s darkest deeds and to save Sido from the guillotine. Although this is a YA novel, I wouldn’t label it as a romance novel. Although there is a strong connection between Yann and Sido, it is definitely not at the center of the novel. The novel is more about the tensions in Paris, the fervor spreading across the city as hatred for the rich is mounting and mounting. Sido is swept up in the middle of it all due to her Marquis father, who doesn’t even want her around. Cound Kalliovski is vile, cruel, and wants Sido as a wife. But then there is the wonderous Yann. He needs to figure out a way to save Sido from two very distinct types of death. Marriage to the count and the guillotine. The book itself is a bit iffy on the facts of the revolution, but the revolution is really just a backdrop to the interwoven story between Sido, Yann and the count. There were a number of plot twists that I anticipated, but just as many that I didn’t see coming. There is a magical realism element with Yann’s ability to see threads of light hovering around objects and people around him, allowing him to telepathically move things at a whim. The novel is well-paced and I like the variety of characters that are introduced. Gardner doesn’t dwell too long on any one element of the novel, but I didn’t feel rushed through the novel either. For reader’s advisory, I think this could be an easy sell for boys, despite the girly cover art. A book about death, revolutions, and a man who can control the entire city of Paris with blackmail and murder threats isn’t an easy book to turn down. This is also book one in a series. Book two is The Silver Blade. I was lucky enough to listen to the audio book narrated by Tom Hiddleston. His narration is flawless. His accents, the voices are all so unique, he really does bring the book to life. His menacing Count Kalliovski that he portrays is spine-tingling. I think he’s narrated one other audio book to date, a James Bond novel. I’m eager to listen to that one next. This entry was posted in Books and tagged Book review, sally gardner, the red necklace. Bookmark the permalink.